Please note: This is not my work, I have included it on my pages to help my fellow modellers. 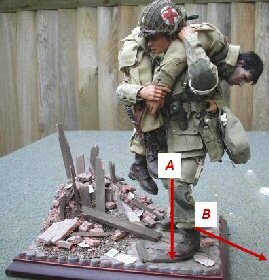 I found this information about setting the pose on a figure, as I needed to find a method of somehow strengthening the legs on my Carrying Casualty figure as shown on the right. Because the legs on the figure have gradually over time since I made the kitbash become weakened, so that the standing figure of the pair will no longer stand up, due to the knees sagging under the weight of the second figure A, plus the ankles also let the figure fall off to one side B.
I have already tried to re-tape the joints tighter again, but since the joints have now become loose. I have found that the tape does not get into the joints fully, so over time it allows the joints to fail again. So I will have to try to see if this method will work for my kitbash. After reading the topic on the OneSixth UK forum, I contacted Gordon about how he adapted his figures. And he has very kindly allowed me to make this page, as I feel this will help us all to make better models. The text in italics below are the instructions from Gordon himself. I have been asked about how I get my running poses on my bashes, so have tried to explain same with this little tutorial. Bearing in mind this is my chosen method. 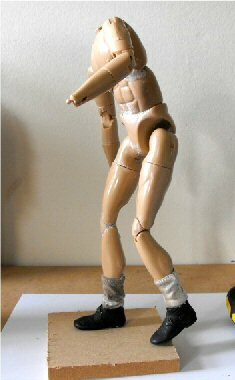 PLEASE, do not try this if you wish your figure to remain fully poseable. Once set, within a few seconds, it is set for life. 1. 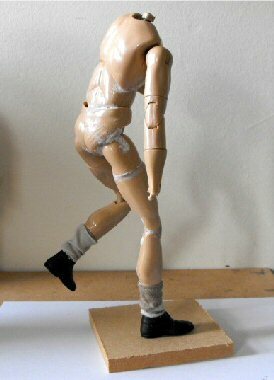 Using an old sideshow body, brogans and socks. 2. The materials I use. 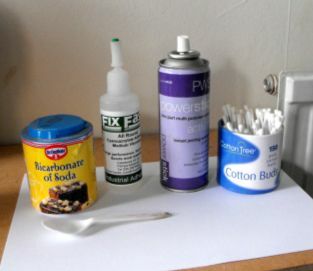 (A - soda, B - cyanoacrylate glue, C - glue activator and D - cotton buds), 3. & 4. 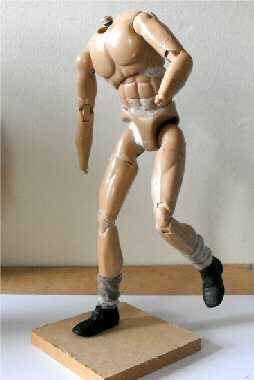 Play around with the pose you wish the figure to have. 5. 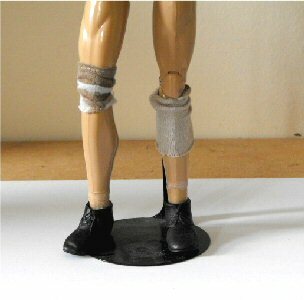 I cut the feet of the socks and slip them up the leg, put some glue in the boots and attach them to the feet. 6. 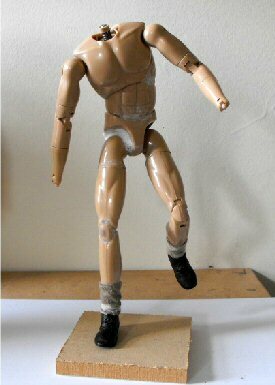 I next carefully dribble more glue down into the boot and dust on with the spoon some baking soda, I use the same idea around the ankle joint above the boot. 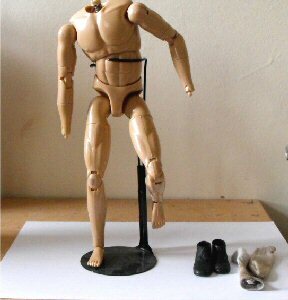 Tip off the excess soda and clean it up with a cotton bud, so now I have one solid boot and foot ankle joint. 7. 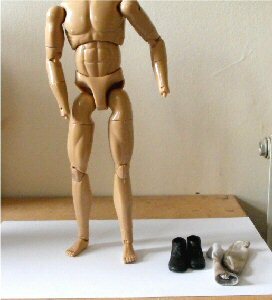 Now for the socks, I need the cotton bud and white wood glue. 8. With the cotton bud apply some glue around the leg above the boot. 11. 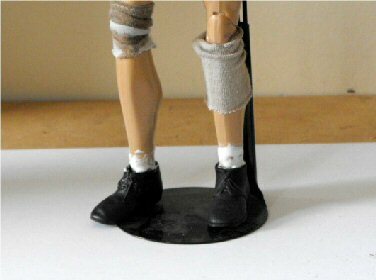 Upwards we go onto the knee, try not to move out off desired position apply glue and soda to the joint. 12. A little squirt of the activator will set this of in seconds and clean off soda dust. 13. 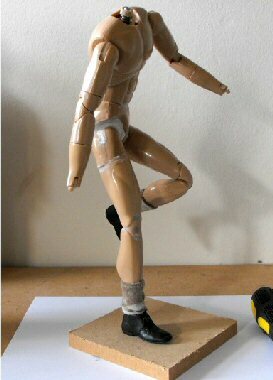 Up onto the hip and pelvic joints I build up this with layers off glue and soda, all set of with the activator. That basically completes the standing support leg. 14. I do tend to weld the waist and chest joints on my bashes. 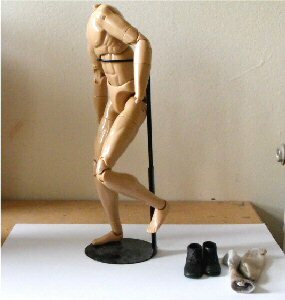 15. figure attached to a temporary base with a screw up into the boot and heel of figure.15 & 16. as you have seen it works, I leave the trailing leg joints unwelded, as it helps to get the trousers on and you can do a little change of pose. Well that's how I come up with my poses, all my bashes get this done whether standing or running ,the only ones I leave fully poseable are my mounted fellows. 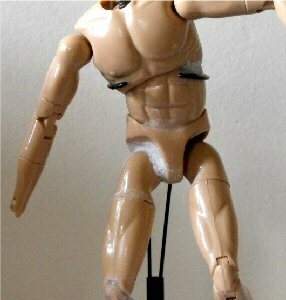 I do not have action figures, mine are more action statues. Hope this has been of some help, its not for everyone this method but does allow some dynamic poses, if you are willing to give it a bash. Many thanks to Gordon for the idea and his kind permission to use the images above.